Each week for 26 weeks, I am publishing a post about women who are not widely known but should be—women who can inspire us, teach us, and encourage us to get out of our comfort zones and reach for our dreams. Week 19 of my A to Z challenge introduces us to Susette La Flesche. When I first contemplated whom I would choose for the letter S in my A to Z Challenge, I started researching Sophia Duleep Singh. I was pleasantly surprised to discover that much has been written about her since her notable absence from the recent feature film Sufragette. So I kept digging, searching for a woman of equal significance who was lesser known. I found that woman in Susette La Flesche. Susette was born in 1854 near Bellevue, Nebraska. Her native name was Inshta Theumba, which translated to “Bright Eyes.” Both of her parents were of mixed heritage. Her mother, Mary Gale, was the daughter of an army contract surgeon and an Omaha-Iowa woman. Her father, Joseph La Flesche, also known as Inshtamaza or Iron Eye, was the last chief of the Omaha tribe: “Although Joseph La Flesche was a chief of the Omahas and lived as an Indian, he believed that the Omahas should adapt to the dominant white culture. His children, therefore, were raised at home according to Omaha tradition, but they received a formal education at the reservation’s Presbyterian missionary school, where they learned to speak English and to read and write. Susette and two of her sisters were later also sent to a private finishing school in Elizabeth, N.J. After graduation, Susette returned to the reservation and took a teaching position at the government-run Omaha Indian School” (infoplease.com). In 1878 Susette and her father visited members of the Ponca tribe in Indian Territory (now Oklahoma). The Ponca tribe was closely related to the Omaha tribe; they had been forcibly removed from their homeland in Nebraska the previous year and were sick and starving in their new location. Witnessing this injustice firsthand moved Susette to act. The following year she wrote a petition on behalf of the Omahas, calling attention to the federal government’s mistreatment of the Ponca tribe (infoplease.com). The Principal Chief of the Ponca Tribe, Standing Bear, left Oklahoma in the winter of 1878 with other members of his tribe, attempting to walk back to their homeland. When they arrived at the Omaha Reservation two months later, the La Flesche family offered them food and shelter (nrcprograms.org). The army came to the Omaha Reservation the following spring to force Standing Bear to return to Oklahoma. Susette made a name for herself at Standing Bear’s trial in 1879, where she testified on behalf of the Ponca tribe, and subsequently wrote several articles about the case: “The court’s decision was the first one acknowledging the human rights of Native Americans, and stated that Native Americans were free to choose where they wanted to live” (nrcprograms.org). Thus began Susette’s dedication to Native American advocacy. Following the trial, Susette and her brother Francis accompanied Standing Bear on a lecture tour of eastern cities. It was during this tour that she met Thomas Tibbles, a reporter from the Omaha Herald. Both Susette and Thomas (T.H.) testified before Congress about the violation of Native American rights (nebraskastudies.org). After the lecture tour was completed, Susette and Thomas married, and together they continued to fight for Native rights and the allotment of tribal lands to individuals. They believed it would be more difficult to take away an individual’s land than land owned by an Indian nation. They were influential in the passage of the Dawes Act in 1887, at the time considered a progressive law of benefit to Native American tribes. The Act authorized the President of the United States to survey American Indian tribal land and divide it into allotments for individual Indians (nrcprograms.org). In 1887 Susette and Thomas embarked on an extensive lecture tour of Great Britain: “T. H. and his wife demanded the abolition of the reservation system which placed the inhabitants at the mercy of the ‘Indian Ring’ – a nebulously defined complex of licensed traders, administrators and politicians, all of whom were alleged to derive huge and fraudulent profits from funds appropriated to be expended for the exclusive benefit of the Indians. Instead, they proposed that the Indians should be placed upon an equal legal footing with whites – ‘law is liberty’, as Bright Eyes wrote in her introduction to T. H.’s The Ponca Chiefs. Instead of being a protection to them, confinement on the reservations kept the Indians in a perpetual state of misery and degradation, and isolated them from all progressive influences” (chiefstandingbear.org). What those who supported the legislation didn’t understand at the time was that while the Dawes Act was passed with good intentions, the results actually eroded Native American culture even further. Following their return to the states, Susette and Thomas were present in South Dakota during the winter of 1890-1891: ” T.H. was personally present at Wounded Knee during the hours leading up to the infamous massacre and was alerted by an explosion of gunfire as he rode back to Pine Ridge. The Indian survivors, five men and fifty-one women and children, were brought into the agency that evening. All but one old woman and a baby were injured. The men were taken for treatment in the soldiers’ quarters but no one quite knew what to do with the women and children. It was at T.H.’s suggestion that the Rector was approached for permission to tend them in the Episcopalian church, where Bright Eyes laboured to comfort them. T.H.’s pronouncements on the subject, in which he mostly attributes blame for the tragedy to the army, were several generations ahead of its time for their enlightened and sympathetic perspective. The honest journalist got his story just the same, being one of the very first, or even actually the first, to break the news of the tragedy to the outside world” (chiefstandingbear.org). 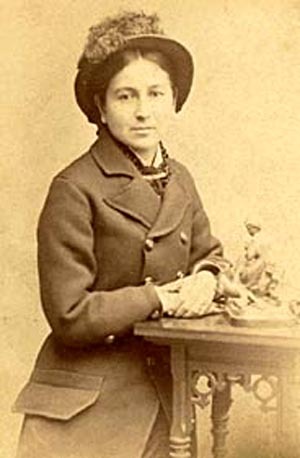 In later years, Susette continued to write, lecture, and advocate for Indian causes. She and her husband moved to Bancroft in 1902 to live among the Omaha, where she died on May 26, 1903 at the age of 49. Following her death she was eulogized in the U.S. Senate, and today she is recognized as the first woman to speak out on behalf of Native Americans (nebraskastudies.org). 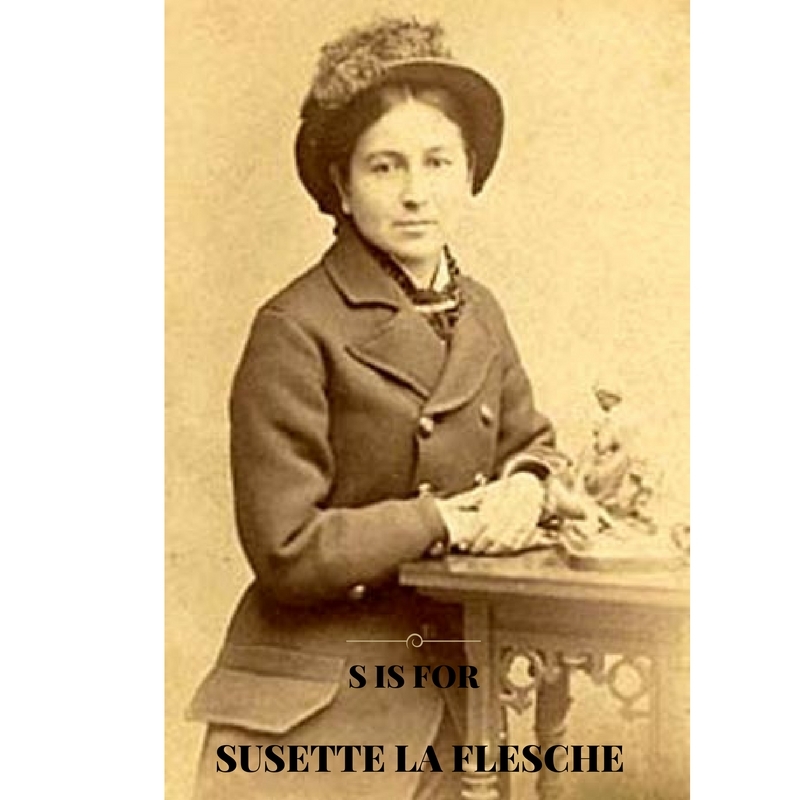 S is for Susette La Flesche, writer, lecturer, and advocate for Native American rights.